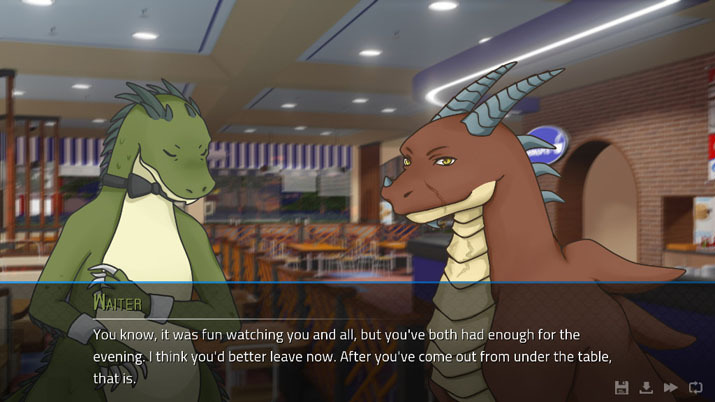 Angels with Scaly Wings is certainly not a parody; On the contrary, it’s a visual novel for lovers of all things dragons, mystery, and romance. Those who’ve been following it have seen it go from “175% Funded” on Indiegogo to it being greenlit on Steam, complete with its dramatic trailer and traditional media kit. This trailer plays again, at the start of the game, promising intrigue and science fiction, along with screenshots of various characters and scenes that appear throughout the game. 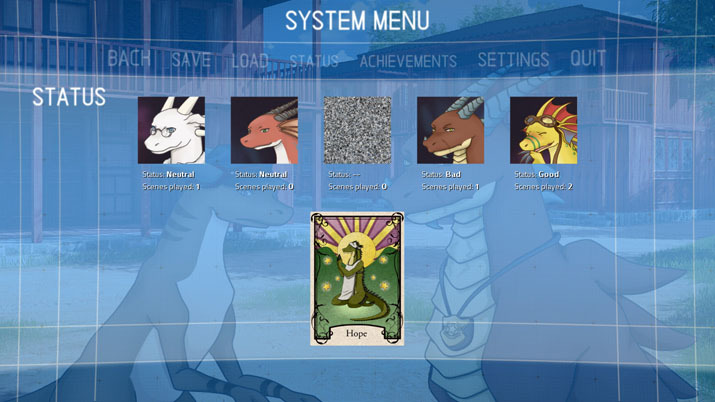 The player starts off as an ambassador for humanity, chosen to enter a newly-found portal that leads to a world filled with anthropomorphic dragons. 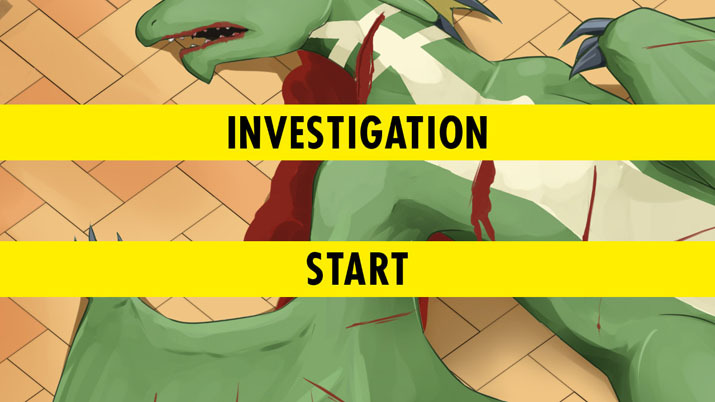 In this strange yet very familiar universe, he or she becomes involved in a murder-mystery case, various side missions, and has the option of starting romantic engagements with the inhabitants of this new draconic world. The main character is a vague yet likable biologist-turned-ambassador with no clear gender or sexuality, so it’s easy to slip into the role. 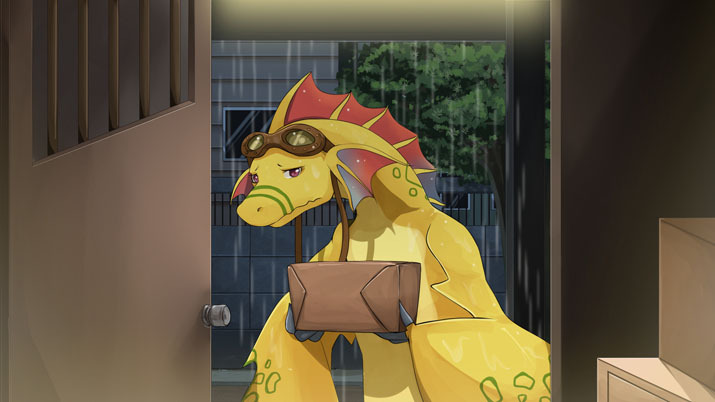 Unlike other single-minded dating sims, Angels with Scaly Wings has much to explore. In this exercise in world-building, the player, through investigation and conversation, can learn about the lore and uncover the mystery of the world beyond the portal. Developer Radical Phi included lore and literature through books in-game, which gives depth and dimension to Angels with Scaly Wings. The choices that the player makes also affect the storyline, to a greater extent than your average visual novel. Rather than simply making choices to woo potential suitors, the player is given a variety of puzzles and choices, each with the potential to alter the outcome of a playthrough. For this reason, the game offers multiple scenarios and endings, and a second time around is relatively painless because of the “skip” function available after finishing it once. If the player has navigated a certain scene satisfactorily, Angels with Scaly Wings gives them the option to skip ahead to a scene the player has yet to experience. Though it may stand out among dating simulators, it also fails to do much else. Angels with Scaly Wings’ dialogue is monotonous and bland, or overstated and silly. It often overwhelms the reader with ellipses that ultimately fail at building suspense and end up feeling like the evil but overly simplistic plan of a Bond villain. Disappointing as well is the fact that scenes don’t always match up, like a character referring to a situation that has yet to occur in the storyline. Then is the romance… Whenever available, there’s an option to be overtly flirtatious with nearly every single character in the story. The art and animations are, at times, mediocre. Animations consist of characters’ cutouts sliding off and on screen, and objects buggily disappear when facial expressions change. Designs for conversational characters have been rushed. Shading and proportions are messy, and even the line art has some amateur qualities to it. It wouldn’t be worth mentioning if some of the visuals didn’t stand in such a stark contrast to cut scenes where new characters are introduced or pivotal points in the storyline take place. The digital paintings in these enjoy such skilled highlighting, shading, and line work, they render gameplay graphics uninviting by comparison. Angels with Scaly Wings also suffers from a lack of consistency in terms of style; perhaps too many artists with a broad range of influences and skills, contributed to its development. The soundtrack can be equally disappointing, not because of the individual songs, but because of the implementation of the music in-game. Several songs have been recycled based on the tone of the scene, be it dramatic, suspenseful, romantic, or comedic. Each plays for about thirty seconds to a couple of minutes, and there is an audible pause before it loops. Repeating generic music is tiresome after a while, and doesn’t contribute to the experience itself.